Let's review the equation, shall we? 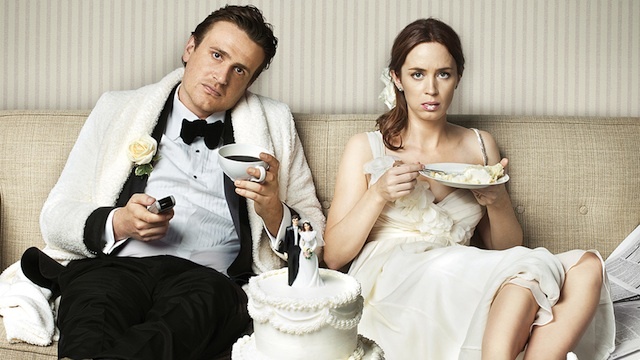 The charming Jason Segel + the charming Emily Blunt + the very funny Chris Pratt (Parks and Rec) + the equally amusing Alison Brie (Community) + a comedy of errors + a fair amount of heart = _________. By my calculations, the blank on this worksheet should be filled in with something along the lines of "success" or "hilarity." Somehow, though, the math has been botched. The formula has been tampered with. These elements do not add up to the pleasant, raunchy, good natured comedy that The Five-Year Engagement should have been, but instead lead a confusing mess of fractures, misplaced decimal points, and faulty mechanics that frustrate the basic narrative and lead to a film in the midst of an identity crisis. Five-Year begins on with a few promising notes. Tom (Segel) and Violet (Blunt) are a young couple in love. They mix well together, and we sense we'd be alright seeing them tie the knot. Life, however, has other plans. Five-Year runs 20 minutes too long and becomes hampered by the worst parts of reality infringing on what could otherwise be a slick piece of celluloid. Tom and Violet move, they're underemployed, they have accidental affairs, they go to graduate school, they breakup, they makeup, they become bored with one another, they change their minds again. The writing isn't smart enough to sustain the twists and turns, and the story collapses in on itself. There's a great moment or two (Brie and Blunt have a Cookie Monster and Elmo-voiced heated discussion worth a look), but they're tucked under the nonsense. Tom and Violet are, basically, the couple you know in real life who you start to hate to hear about and you're just like do it or don't, but let's move on. Yeah, that's what I suspected... I haven't seen it yet, but last night I was trying to decide between The Five-Year Engagement and Bachelorette, so I saw the trailer, and was very disappointed. Seemed pretty boring, especially because I had such high hopes - like you said, it has all the great elements.